Bitmain maintains that not only was the restructuring ‘inevitable’ due to the speed at which Bitmain has been growing its staff, but that Bitmain is in fact still hiring, with an official stating ‘as we move into the new year, we will continue to double down on hiring the best talent from a diverse range of backgrounds.’ Bitmain contends that while it is known primarily for mining rigs, a revenue source which has certainly taken a hit in the market downturn, with Cointelegraph reporting on their Israeli center, and Chinese miners reportedly dumping mining devices en masse. While Bitmain's official line is that nothing is wrong, it is becoming clear that crypto mining is becoming extremely hard to make money with. Bitmain's restructuring comes soon after Consensys enacted a similar restructuring which has been characterized as ‘ruthless and swift,’ and apparently in response to the overall bear market crypto has been facing in the lead up to the end of the year. GMO Internet, previously a significant provider of hash power and mining rigs out of Japan, has pulled the plug on all crypto-mining related sales and business. Ebang, a Hong Kong based mining rig manufacturer has also quietly refiled its IPO in such a way that indicates their revenue fell by half. Miners need profit or that ends. No one will pay to mine altruistically just for BTCs sake, not with hash rate that matters anyways. Incentives are econ 101. And when you look at the incentives now they are: monopolizing mining, or PoS/DPoS rent seeking for the already wealthy. Individual miners are perhaps hit the hardest, already working with negligible profit margins, miners are seeing slimmer and slimmer rewards from plummeting crypto values, often not enough to make up for electricity costs. Earlier this month Bloomberg noted that Bitcoin’s hash rate fell as mining operations started to consolidate earlier this month as only mining efforts at huge scale could mantain profitibility. 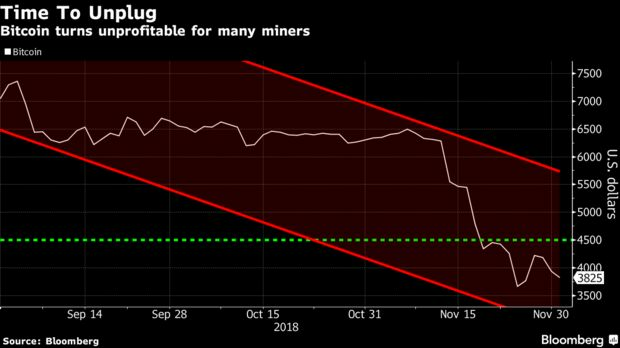 Now, apparently, huge mining rigs like GMO and Bitmain are also seeing trouble maintaining profits, which puts the future of crypto mining in uncertain terms.